Light Weight Deflectometers for the dynamic plate load test from TERRATEST are in use all across the world. Brandenburg Gate provides thus an appropriate setting for our newest video about the Light Weight Deflectometers from Berlin. 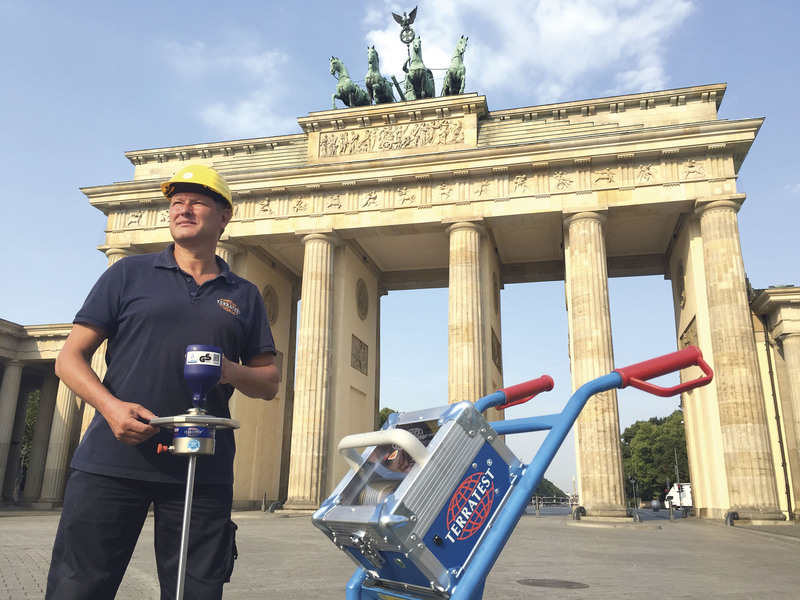 “The setting in front of Brandenburg Gate is unique, everyone knows this historical landmark”, says Frank G. Schulz, TERRATEST’s CEO. “What would be a more logical move than filming the Light Weight Deflectometer in front of the Brandenburg Gate”, adds Schulz. The shooting wasn’t as easy as one might think. Berlin’s landmark is popular with tourists literally all day and night. “We had to repeat the shooting a couple of times, until we finally recorded all the scenes without any tourists in the picture”, explains Beatrice Schwarz, recording director of Ideenfabrik. For a couple of years now Ideenfabrik has been responsible for the innovative advertisement about the Light Weight Deflectometer from TERRATEST. 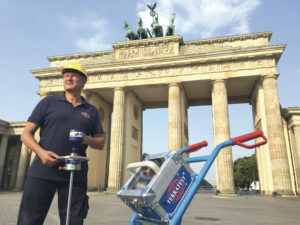 With the Light Weight Deflectometer the dynamic plate load test can be performed quickly and uncomplicatedly everywhere, surely also during the next road and path construction works in front of Brandenburg Gate. For a couple of years now Berlin Senate requires tests with the Light Weight Deflectometer or Light Drop Weight on all public roads. Accordingly, in 2010 specifications for the executing companies were issued by Berlin Senate on how to make use of the Light Weight Deflectometers. These are set down in “Verbindliche Regelungen für die endgültige Wiederherstellung von Fahrbahnen, Geh- und Radwegen nach Aufgrabungen“ (Binding Regulations for the final restoration of roads, foot and cycle paths after excavations).